Just like the March 7th snowstorm — don't be fooled by quiet, dry conditions Wednesday morning, as the worst and most wintry weather arrives during the afternoon and evening hours. While models have backed off slightly on Wednesday's snowfall potential, I see no reason to change my previous snowfall forecast at all. Expect 6 to 12 inches of snow accumulation across most of New Jersey. 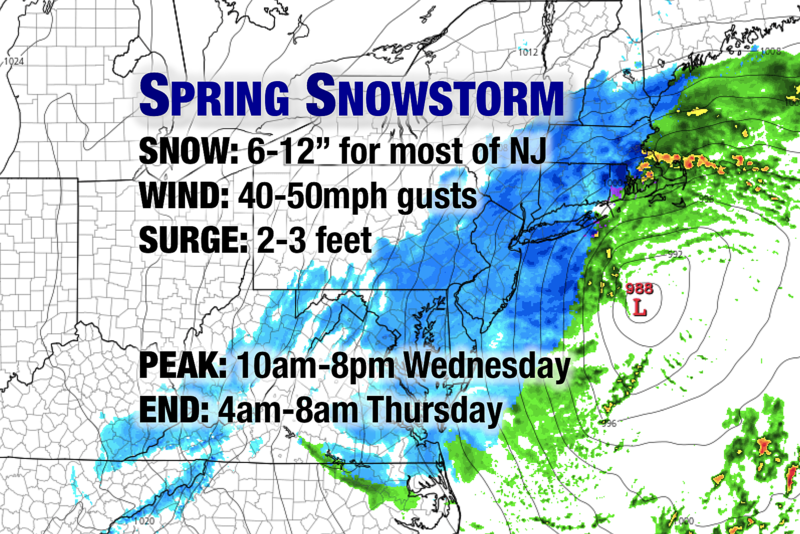 Northwestern NJ could see a bit less as they fall outside of the heaviest snow bands. Coastal NJ will see much less as rain/mix holds on through part of the afternoon. I still do not buy the truly arrogant forecasts of 18 to 25 inches of snow that some have published. NOW: As of this writing, the state is split in half with mostly snow north of Interstate 195 and mostly rain to the south. I'm seeing regular wind gusts over 20 mph inland, and close to 40 mph along the Jersey Shore. 10 a.m. Wednesday: Let the brunt of the storm begin. Bands of heavy snow will form and push across New Jersey, severely reducing visibility and starting the snow pileup. 11 a.m. Wednesday: Approximate time of the morning high tide along the Atlantic Ocean. (Remember: High tide along back bays and tributaries occurs up to 3 hours later.) 2 feet of surge is expected to cause minor to moderate flooding. Heed any and all road closure signs, and never attempt to drive, swim, or walk through flooded areas. Noon Wednesday: Winds will be kicking by this point, straight through the afternoon. Sustained winds 15 to 25 mph. Gusts to 40 mph inland, and 50 mph along the coast. 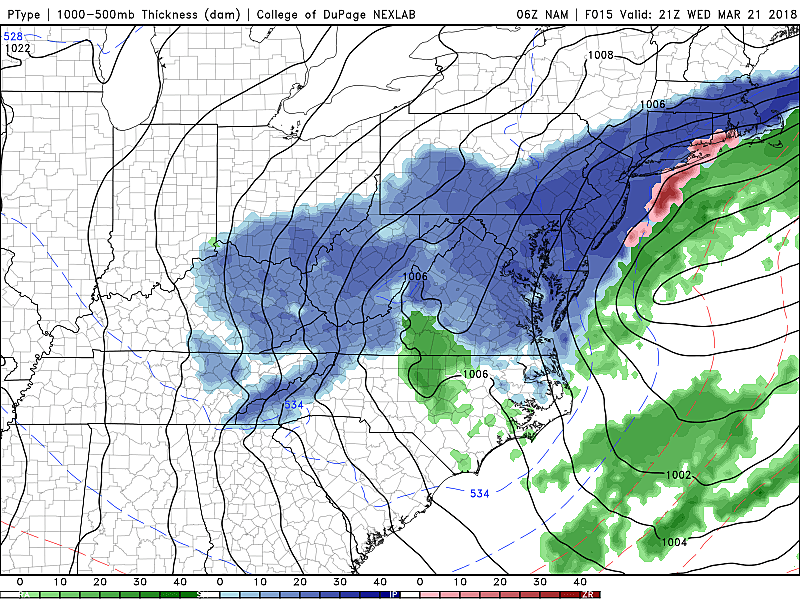 2 p.m. Wednesday: Even southern and coastal New Jersey changes over to all snow. Maximum snow accumulation will occur during the afternoon and early evening hours. 5 p.m. Wednesday: Still snowing at a steady clip. The evening commute will be a nightmare. 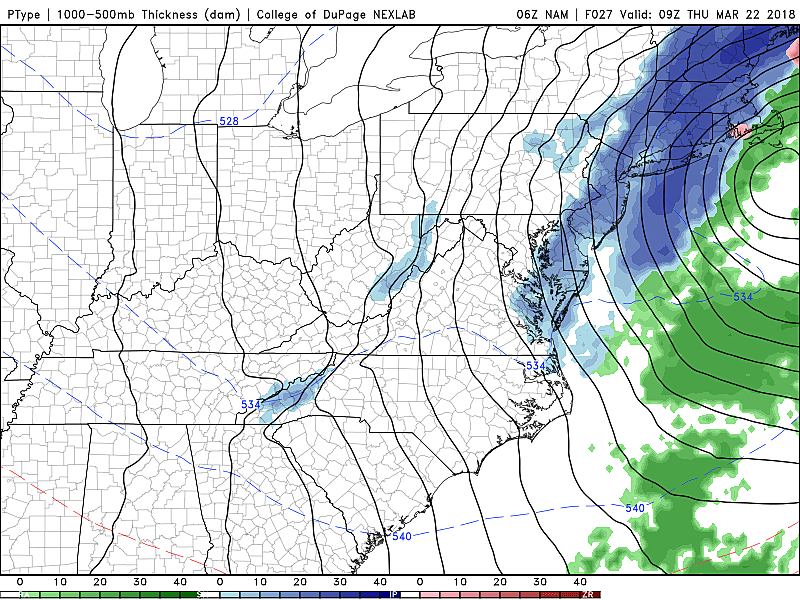 8 p.m. Wednesday: The truly heavy snow starts to calm down, as the storm system's strongest forcing shifts off-shore. Snowfall is still expected through most of the overnight hours. 11 p.m. Wednesday: Approximate time of the evening high tide along the Atlantic Ocean. 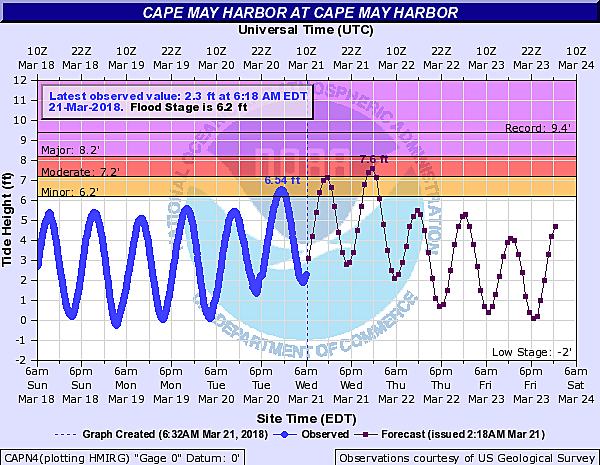 (Remember: High tide along back bays and tributaries occurs up to 3 hours later.) This is forecast to be the highest water level not just of this storm, but of any of the storms this month. 3 feet of surge will cause moderate flooding, including another round of road closures and possibly some property damage. 4 a.m. Thursday: The beginning of the end. In the early morning hours, snow will end from west to east. 8 a.m. Thursday: Final flakes, as snow showers exit the Garden State. Noon Thursday: Approximate time of Thursday's first high tide cycle along the Atlantic Ocean. (Remember: High tide along back bays and tributaries occurs up to 3 hours later.) 1 to 2 feet of surge may cause minor flooding once again along tidal waterways. Major Snow: Most of New Jersey is expected to experience at least a half-foot of snow accumulation. Snowfall rates may exceed an inch an hour at times. Shoveling such dense snow will be a beastly task. Difficult Travel: Visibility and road conditions will be poor for most of the day, especially during the heaviest snow in the afternoon and evening hours. Numerous flights have been cancelled at area airports. Coastal Flooding: Some of the highest tide levels of the year are possible on Wednesday. 2 to 3 rounds of minor to moderate flooding is forecast. Power Outages: The combination of heavy, wet snow and gusty winds will cause downed trees and power lines. Another round of widespread power outages is likely. Closings: As of this writing, over 300 school closings have been reported for Wednesday. Another round of closings and delays is likely for Thursday, especially if the highest snow totals verify. After snow showers end Thursday morning, we'll see mostly to partly cloudy skies for the rest of the day. Winds will stay elevated, sustained at 10 to 20 mph with gusts to 30 mph (out of the chilly northwest). High temperatures are forecast to reach the lower to mid 40s — far enough above-freezing to kickstart the snow melt, but still about 10 degrees below normal for late March. Friday remains cool, with highs in the lower to mid 40s once again. Skies will feature a mix of sun and clouds, with a few potential snow showers thrown in for good measure. Saturday looks pretty pleasant, with an extended period of sunshine. However, high temps will still be stuck in the chilly lower to mid 40s. We have been tracking another storm system for this weekend. Or should I say we had been? 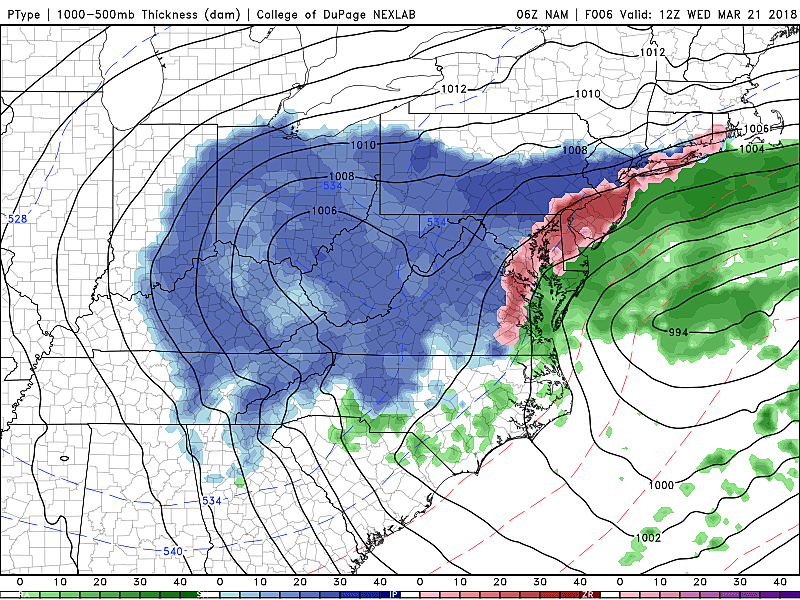 Forecast models now shove that storm thoroughly south of New Jersey. We'll still see some thicker clouds on Sunday and probably some snow showers. (Up to an inch of accumulation, maybe?) But this one won't be a direct hit. Because of the clouds, snow, and on-shore flow, temperatures will get stuck closer to 40 degrees on Sunday. We're on-air and online all day and all night with the latest weather, traffic, and news updates. No matter where in New Jersey you are, it is going to be a nasty, wintry day. Please exercise extreme caution and common sense. Be smart, be safe, and think warm thoughts!